The Every Student Succeeds Act (ESSA) presents significant opportunity for school leaders to shape the systems and services necessary to meaningfully improve outcomes for all students. Specifically, the law provides a much greater emphasis on flexibility in decision making and funding options related to assessments, comprehensive accountability systems, and mechanisms for identifying and supporting schools in need of improvement. 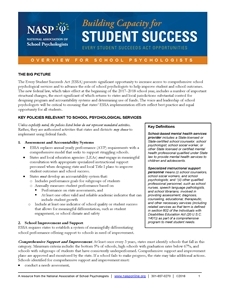 Further, ESSA requires that states and local education agencies (LEAs) engage in meaningful consultation with appropriate specialized instructional support personnel, such as school psychologists, when designing state and local Title I accountability plans to improve student outcomes and school success. 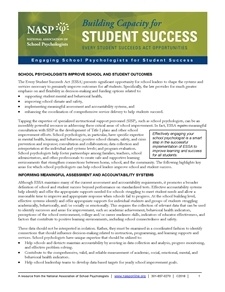 As experts in assessment, including evaluating nonacademic factors in student success, school psychologists are uniquely positioned to meaningfully contribute to the decision-making process in the development of new accountability procedures. For the last 15 years, school and student success was almost entirely defined by performance on standardized tests intended to measure progress toward state academic standards. Although states are required to administer annual academic assessments and include this data as part of their accountability system, ESSA promotes a broader definition of school and student success that includes indicators of school quality such as student engagement or school climate and safety. By improving the quality, not the quantity, of assessments, schools, families, lawmakers, and other stakeholders can have a more comprehensive and useful measure of school functioning and student success. Facilitate the development and implementation of comprehensive needs assessments to inform data-based decisions made about the needs of individual students and the school system as a whole. Contribute to the comprehensive, valid, and reliable screening and measurement of academic, social, emotional, mental, and behavioral health indicators, including growth towards specific goals. Document the improved performance of all students and groups of students by assisting in data collection and analysis, progress monitoring, and effective problem solving. Facilitate a holistic and comprehensive interpretation of data to help school leadership teams develop and evaluate data-based targets for yearly school improvement goals that reflect the true needs of the school. Equally important to the appropriate collection and interpretation of data is the availability of necessary supports for struggling schools and students. States and LEAs must remain committed to promoting best practices and offering technical assistance and consultation to LEAs and individual schools. Although districts must have the ability to implement various school improvement efforts that are grounded in data and address the unique needs of their community, such efforts are only fully realized when coordinated and integrated within existing initiatives. At the school building level, effective systems identify and offer appropriate supports for individual students and groups of students struggling academically, behaviorally, and/or socially or emotionally. 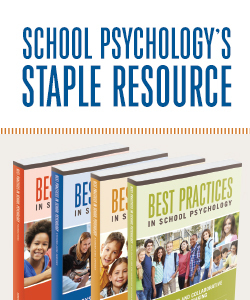 School psychologists have unique training and skills that support integrated service delivery and evaluation of effectiveness at the state, district, school, and student levels. Have advanced knowledge of multitiered systems of supports that integrate individual, classroom, and school-wide academic and behavioral supports, as well as facilitate school–community collaboration. Consult with classroom teachers on the use of evidence-based formative assessments and regular monitoring of student progress to inform instructional efficacy and to improve students’ mastery of curriculum. Facilitate effective collection and evaluation of multiple data sources to determine the needs of students and delivery of appropriate supports. Enhance coordination of efforts to improve students’ academic achievement, social and emotional learning, and mental and behavioral health with school-wide efforts to improve school climate and school safety. Collaborate with parents and families to promote treatment integrity and improve intervention success at home and at school. Use their expertise in program evaluation and research to help monitor school-wide systems that support positive climates for learning and regularly evaluate the breadth and effectiveness of positive interventions and supports. This handout provides an overview of assessment and accountability in ESSA's provisions relevant to decision-makers. View the companion handout for school psychologists.